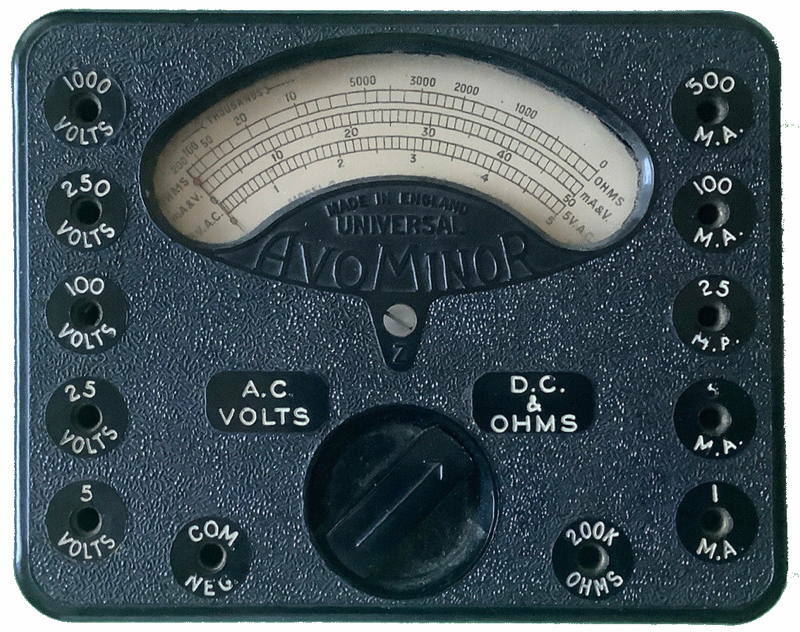 The AVOmeter, was the first true multimeter. It was the first portable, multi functional instrument in the history of the electrical industry. The idea came from the then head of the General Post Office Telephones in London; Donald Macadie. He wanted to combine a voltmeter, an ammeter and an ohmmeter in one housing. For good reason, back in 1923 you had three huge devices, shunt resistors and batteries carry if you wanted to measure voltages, currents and resistances. He invented the world's first multimeter and patented his design. And because it was able to measure Amps, Volts and Ohms, Macadie called his invention AVOmeter. The rights to the brand name AVO are held by Megger today. The moving-coil type of movement for the range of measurements required at the time was ideal because of its good sensitivity, good damping, long scale arcs, low power consumption, short time period and high torque-weight ratio. With the advent of the Westinghouse copper oxide meter rectifiers available in the early 1930's the first truly universal multimeter could be realised. For many years AVO led the field in having a meter which could measure AC voltage and current as well as Resistance and the usual DC ranges. The majority of multimeters made by other manufacturers do not have this facility. 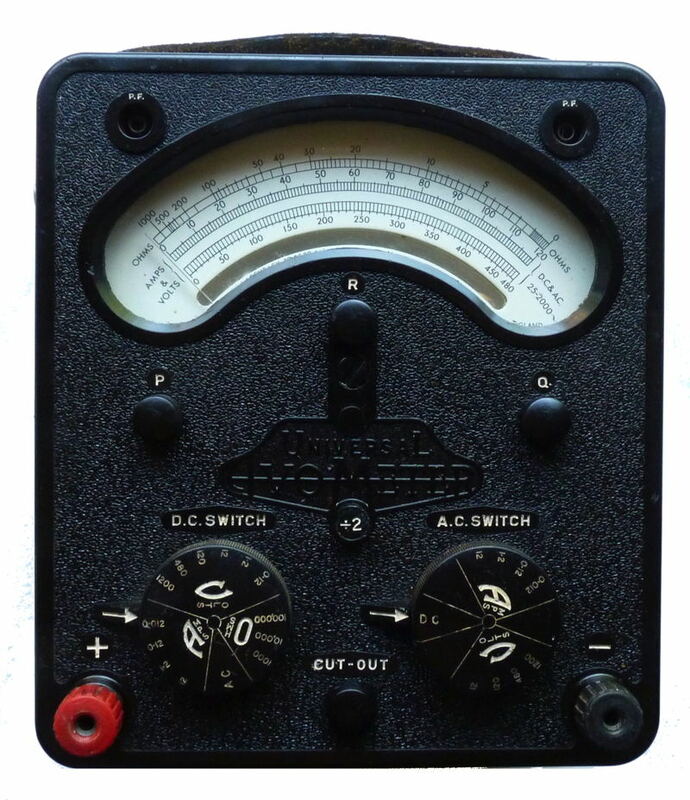 True ohmmeters (such as those originally made by Evershed and Vignoles) measures the quotient of volts and amperes, but many simple instruments merely measure the current through the unknown resistance, assuming that the voltage remains constant during the test. Such instruments should really be called resistance testers rather than ohmmeters. The AVOmeter uses this principle on the resistance ranges. On 23 May 1923 the "Automatic Coil Winder and Electrical Equipment Company" (ACWEECO), was founded. This company not only built the new multimeter but also another invention of Macadie, an automatic coil winding machine. Many of these instruments are still around today and as I have a number of them I have long felt that there was a need for a site or page which covered the whole range. I have been encouraged to do something about it by Andrew Usher who also felt that there was a need for an AVO page similar to that for Simpson meters at www.simpson260.com. I have used the text file he sent me as a basis for the following pages. Images other than those of the meters in my possession have been gleaned, cleaned up and resized from various sites on the internet.